I am wondering why some people don’t like cauliflower, is it the texture? the flavor? what is it that some people really hate cauliflower? I find it to be such a delightful vegetable, and so versatile. I decided to call this a steak simply because it’s as thick as a steak and is cooked like a steak, “juste poêlé” but most of all it does replace meat. Here I have also used cauliflower purée in the rice, which gave it a smooth and creamy texture, brown rice tends to remain firm and not as creamy as arborio, so the purée added a more delicate texture to the brown rice. It’s somehow a cauliflower celebration. I would have preferred to use arborio “integrale” which is brown arborio, but did not find at the store, I’m not sure they carry it in the US. I am always trying to develop new ideas and recipes for vegetarians. I don’t know what is going on in other parts of the country, but in the Bay Area, there are so many people with different nutrition requirements or restrictions, that as a chef, you always need to create appealing and nutritionally interesting dishes…and to be honest, I really do like this one. It’s colorful, nutritious, light and very flavorful, so what else do you need? just a fork. Proceed like you would for a regular risotto but make it thicker. Infuse saffron in worm broth. Heat oil in a pot, add shallots, let them soften then add rice and coat it with the oil for a a few seconds. Add wine and broth gradually until the rice is cooked and absorbed (you need a thicker texture than regular ristotto). Add 4 tbs cauliflower purée, adjust with salt and pepper. Add parmesan, stir well and truffle oil at the end. Boil carrots in salted water. When soft, remove from heat, drain and place in a mixing container (or in the same pan they have been cooked). Mash with a potato masher to desired consistency (I like it when the carrots are not too fine and smooth, so I can feel some texture). Place back on slow heat and add cream, salt and pepper. Mix well and keep warm. Cut the cauliflower crosswise, four 1 inch thick slices. One slice can be used for 2 people. 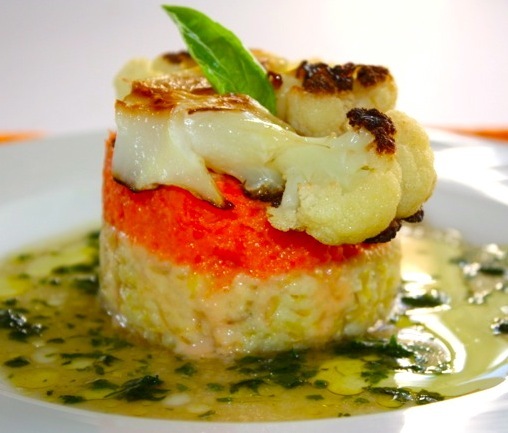 Heat olive oil in a pan, cook cauliflower steak on both sides until they turn brown. Use the leftover cauliflower to make into a purée. Boil cauliflower in half milk/half water, when soft mash into a purée. For the basil jus, bring broth to a boil, add basil and cook for 30 seconds, remove from the pot and pat dry. In a blender, mix basil with broth to make it into a very fine mixture. Remove from blender into a bowl, add olive oil and lemon juice, salt and pepper if needed. 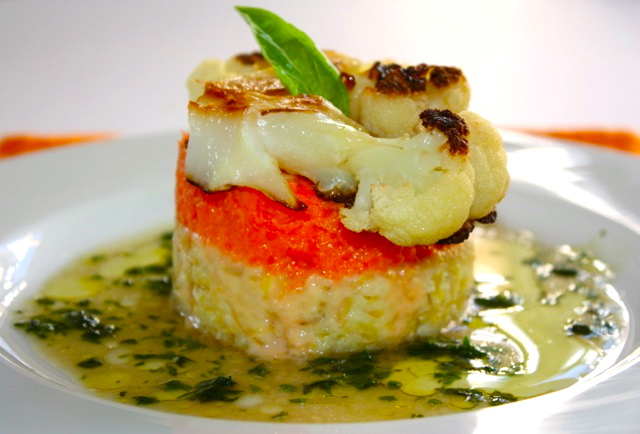 To assemble the dish, using a rind, place some risotto as the first layer, then add a carrot layer, finish by delicately placing the cauliflower steak on top. 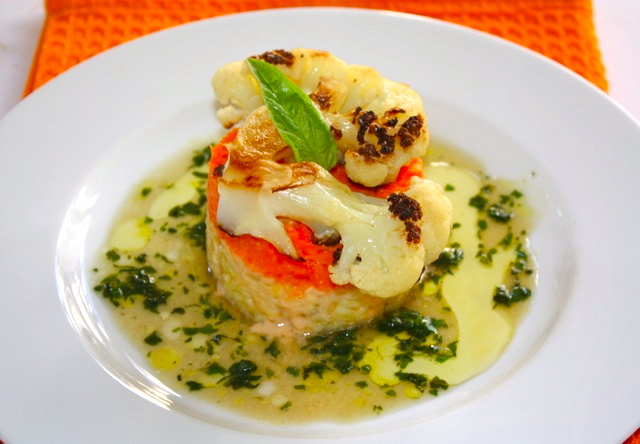 Decorate with a few tbs of basil jus around the risotto. Serve hot. This entry was posted by silvia on December 20, 2012 at 6:32 am, and is filed under Rice, Vegetables, Vegetarian - dairy. Follow any responses to this post through RSS 2.0.You can leave a response or trackback from your own site. Wow!!!! Quel super plat végétarien. JE note cette belle recette! So creative. I’m with you and love cauliflower. Had not thought to mix a puree with brown rice. I think that is brilliant. I don’t really get the ‘steak’ idea though. I’m not sure vegetarians care if they are replacing steak with a veg. I’m intrigued by the idea of cauliflower ‘steak’. It’s the kind of simple cooking that I love. And I’m always looking for new ways to eat my vegetables! I had a fabulous dish in FL last week: chimichurri sauce on the bottom, topped with mushroom risotto, topped with cauliflower steak and a few roasted carrots, topped with some sort of crunchy onion.